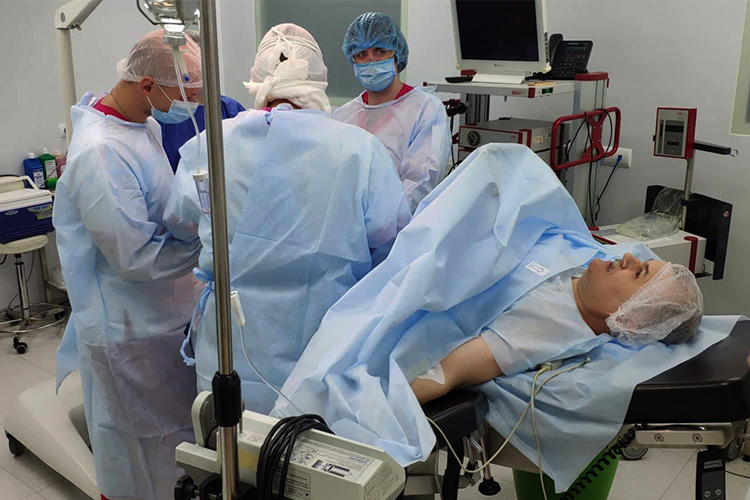 Within the Bioengineering Rehabilitation for Wounded volunteer initiative, doctors performed a complex surgery for Volodymyr Ivanovych, AFU colonel awarded with the Third Class Bohdan Khmelnytskyi order for his heroic service in the ATO. A bone block grown from the commander’s own cells, has been implanted into his leg. In this way, the doctors expect to restore natural length of the limb that was refusing to fuse up for about four years. Volodymyr Oksymets, ilaya clinic’s chief surgeon, assured us of the successful outcome of the surgery. “Transplantation of the bone block went with no complications. We are going to monitor the patient’s condition for about a week in hospital, and afterwards Volodymyr Ivanovych will be able to undergo further rehabilitation at home. Now we are trying to do our best to make the bone block assimilate in the body,” – the doctor commented. Mr. Volodymyr makes rather a highly respectable patient, so saving him has been an honor for all of us. At the beginning of the war he was commanding a reserve tank base in the city of Bakhmut (former Artemivsk). For that moment, Russian militants had already taken the city, but our fighters held the defense of the unit where several hundred tanks under the Ukrainian flag were stored, to the last minute. On the 24th of April, 2014 the military unit underwent a fierce attack: about a hundred separatists together with Russian military tried to take over the base and military equipment, for one more time. And it was only the commander’s resolute order to fire back that stopped the bandits. Later, terrorists started a real hunt for the Ukrainian officer. For a long time, they had been plotting the schemes of neutralizing him and taking over the military equipment. In June of 20154 the commander’s vehicle got ambushed in a pre-planned stakeout. Terrorists opened fire at the vehicle, and Volodymyr Ivanovych got severely injured in the accident. Despite his heavy wounds, he shot back as long as he only could, until the support arrived. As a result of the well-organized work carried out by our military, three terrorists were destroyed and one arrested. Our commander was evacuated to hospital with the heaviest injury: the bone of his leg was totally crashed. Overall, the officer underwent seven unsuccessful surgeries which led to serious complications. Despite all medics’ efforts the leg failed to fuse; moreover, it got shortened to two centimeters, and a false joint emerged in the damaged area. The options that military medics offered, didn’t leave the colonel any chances for full recovery. Still Volodymyr Ivanovych refused to come back to the lifestyle of a retired military as he is aspiring to come back to the forefront. The colonel’s daughter Alina tells that her father feels quite fine recovering after the surgery and hopes to make his first steps soon. “Thanks to innovative technologies applied by Ukrainian doctors and incredible support of ordinary sympathetic citizens we have been given new hope for my father’s recovery. He has undergone the latest surgery well, and now he’s being exceptionally optimistic! All our family if sincerely grateful to the volunteers of People’s Project and in person to the co-ordinator at the Project, Maxym Ryabokon, as well as to each compassionate person who made their contributions into supporting treatment of fighters who defended Ukraine,” – she said. With our efforts combined, we can give a chance for full life to dozens more our heroes who need our support and assistance. Without our aid, they have practically zero chances to get on their own feet.